Buffalo, New York. 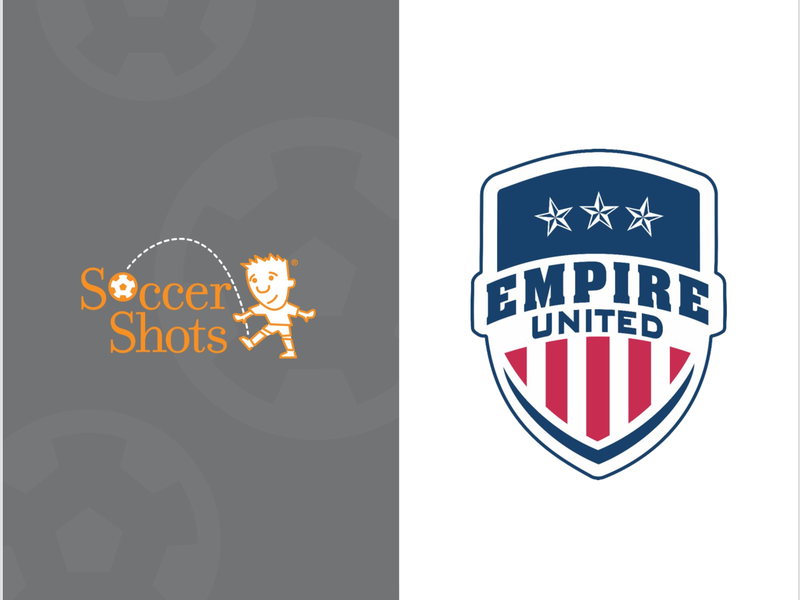 September 12, 2018 - Empire United Soccer Academy and Soccer Shots Buffalo today announced an exciting new partnership. The partnership’s goal is to positively impact children’s lives on and off the field through best-in-class coaching, communication and curriculum. As of today, the organizations will be working together to provide players between the ages of two and six with a program based on foundational skills and character development. The Soccer Shots program is recognized by US Youth Soccer as the only official soccer program for children two to five years of age. “Soccer Shots is the recognized leader in child development soccer for boys and girls ages two to six,” Empire United Youth Director Brian Cribbs said. “Both of our organizations share a common mission, which is to positively impact and foster the development of youth through soccer. We couldn’t think of a better partner.” Cribbs also added that the new programming begins this October with several sessions being run indoor through May. Our youngest players are invited to our “Skills and Scrimmage” program while our older players (up to age fourteen) should register for our “Premier League”. For more information and to register for programs, please visit www.empirehouseleague.com. About Empire United Soccer Academy - Empire United SA is firmly committed to each player’s goals and long term growth and while employing a holistic approach to both character and soccer development with programming designed specifically to create a positive, yet challenging learning environment. We are the only US Soccer Federation recognized club in WNY with a Boys and Girls Development Academy. About Soccer Shots - Soccer Shots is US Youth Soccer’s official introductory program for 2-5 year olds. In its 8th year of operation, Soccer Shots supports approximately 4000 WNY players every year. Focusing on giving players and families a great first experience in the world’s most beautiful game! About the United States Youth Soccer (US Youth Soccer) US Youth Soccer is the largest youth sports organization in the country and largest member of the United States Soccer Federation, the governing body of soccer in the United States. US Youth Soccer registers more than 3 million players annually, ages 5 to 19, and over 900,000 administrators, coaches and volunteers in 55 member State Associations. US Youth Soccer programs provide a fun, safe and healthy environment for players at every level of the game.